Using the bathroom by yourself is an important part of personal independence. There are many ailments and injuries that make using the toilet a real struggle. For the elderly, it can also be a matter of balance that makes using the toilet a safety issue. For these persons a raised toilet seat can be very helpful. 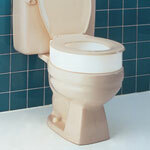 Raised toilet seats are available with and without handles. For those persons who want to use their own toilet seat, Toilet Seat Elevators may the answer. If it is determined that only handles are needed to solve a toileting issue, then the Toilet Safety Frame or the Toilet Support Rail may be the product to consider. For those persons who aren't able to use a regular bathroom, there is the Folding Commode. This handy product can be set up when needed and then folded to be put out of sight when not needed. 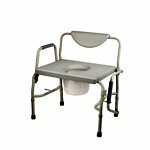 The Folding Commode can also be used in the bathroom over a regular toilet. This gives the person not only a higher seat but a safer and sturdier one as well. 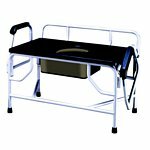 The Folding Commode is designed for easy transport. All the products in this category are not returnable because they are personal hygiene items.